Setting out cross country to get to Melipilla by the “back route” we discovered that Google Earth has some alignment issues and occasionally requires careful interpretation. 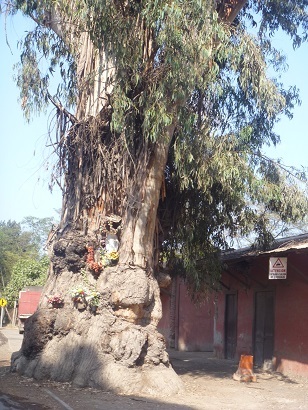 We only backtracked a bit, and saw a great roadside shrine in a huge eucalyptus tree. That was before we got hopelessly lost. Finally regained our route and made it to Melipilla, a fraction of our planned circuit to a national park. Things went better after that and we saw lots of the countryside, including a few father/son duos on horseback. 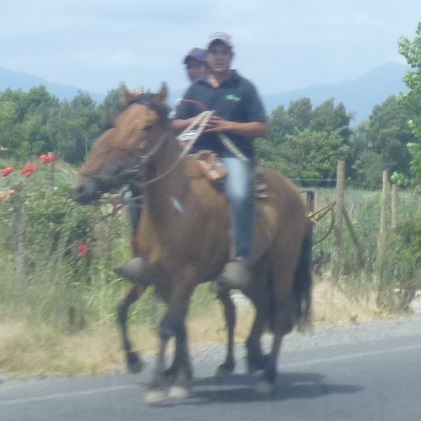 Interesting to see that many riders use some traditional Chilean items of caballero (horseback rider) clothing (hat, short jacket, belt, short boots). A less-traditionally garbed father-son pair out for a ride. We stopped to buy water near the turnoff for the park, and the woman behind the counter said that admission to the park was only by previous appointment–the neighbors were concerned about visitors. She indicated where the turn was and we went on but missed the turn entirely. It was a lovely drive and we returned to our base in Buin through the southern portion of the Maipo Valley and Rancagua.